One of the things I like best about blogging is reading other people’s blogs. A favourite of mine is The Perimeter by photographer Quintin Lake, an ongoing record of his long-distance exploratory walk around the British Isles. I love his choice of subjects and the way he frames his stunning shots, and his often wry humour is a delight. I would love to be able to tramp about the countryside (or the urban environment come to that) noticing and recording what I pass – though a walk on this scale would always have been beyond me. I started to play with the idea of doing a perimeter walk of Cliffe Castle Park, sketching as I went (this being the extent of what I’m realistically capable of, spread over days or weeks or even months) – but not sticking slavishly to the edges. Like Quintin I’ll move inwards a bit here and there where necessary. And to make things more confusing I’ve not begun with a location that’s an obvious place to start as this is not at one of the gates – though it’s very near to the Holly Lodge entrance. The Sensory Garden is still, like so much of the park, a work in progress – but it’s taking shape. The pre-existing raised beds are being planted with herbs, shrubs and plants that all have particular things to offer in the way of texture, scent and colour so that the senses of touch and smell will be as much a part of the experience as the ability to see, and at a height where touching and sniffing are a more natural and easy thing to do. I love this idea, and I found it interesting on this warm sunny afternoon that two girls had chosen to sit on the edge of one of the raised beds amongst the plants in the border, rather than finding a bench. Actually I notice this not-sitting-on-a-seat is quite a common thing in the park, and it struck me as I was drawing that I often do it myself – choose a spot, irrespective of whether there’s something there that’s designed for sitting on. It has to do with knowing where you want to be, I suppose. Anyway, there they were, in dappled sunlight, playing and singing. Below the wall where the girls were sitting is the site of what will one day be an orchard – the top part of the enclosed field that stretches from the Sensory Garden down to the Skipton Road has been planted with young fruit trees, helpfully tagged with labels that include QR codes so that I was able to discover that this one is a young Bloody Ploughman. Perhaps another addition to the sensory experience will be taste! A little further down the field and stretches of grass have been left uncut to be little oases of wildflowers (this whole field has in the past been allowed to grow as a natural wildflower meadow) and there are grasses and clover, poppies and dandelions, dock and sorrel blowing in the breeze and the buzz of flying insects. This journey of mine will be sporadic and most likely non-linear – I’ll probably jump about from place to place without following a regular clockwise or anti-clockwise route – but it’ll take me to parts of the park that I visit less often, and also demonstrate what an extraordinarily varied place it is. For its size it has an enormous range of different kinds of place – it’s truly a park of many parts. you’re very good, I really like your work and this idea will also be a source of inspiration for me. Thank you, really, thank you! …. and you’re very kind! I love the fact that we’re inspiring each other, because I get so excited by so much of what you do too. Thanks! So are you. You say the nicest things! And incidentally I’m really enjoying seeing all your posts on Facebook and reading about some of the remarkable, exciting projects you’re involved with. Lovely to be in touch! How exciting! I love this idea… Particularly the idea of moving in and back out to the perimeter , thinking about”out” have you thought about dipping into the outside world beyond the park walls?! – Just a little way! I do have to say though that I have a problem with you not following a regular clockwise or anticlockwise direction ..: to me if you are doing a perimeter walk it has to join up! – But that’s just me being overly orderly!!! Love this post. I can picture the sensory garden so clearly. I do have to wonder though whether people choose to sit on things other than the benches because the benches are so very uncomfortable? Good to hear from you. Actually I have to say that I agree with you about the walk needing to be a logical clockwise or anti clockwise direction. I’d been thinking about this some more and I’m going to try to stick to being logical. And I hadn’t thought about going outside the park walls but that seems like a good idea too, so if I’m tempted by something I’ll loosen up my protocol a bit! Oh dear I knew someone was bound to bring up the question of uncomfortable benches. 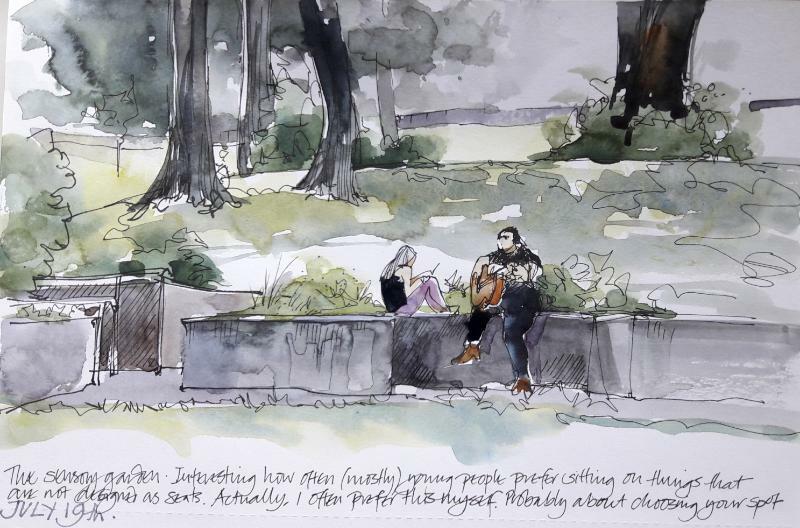 I just don’t know the answer – except that today when I was there I watched people sitting just about equally on benches and on other things, so I hope my thought that it’s about location location location might be at the heart of it……. !